With a stay at Evilion Hotel in Chania, you'll be near the beach, just steps from Stalos Beach and a 4-minute drive from Agioi Apostoloi Beach. The front desk is staffed during limited hours. Limited parking is available onsite. With a stay at Helgas Paradise in Rhodes, you'll be within a 15-minute drive of Seven Springs and Afandou Beach. Featured amenities include luggage storage and a safe deposit box at the front desk. When you stay at Olympia Apartments in Chania, you'll be by the sea, within a 5-minute drive of Stalos Beach and Agioi Apostoloi Beach. Free self parking is available onsite. 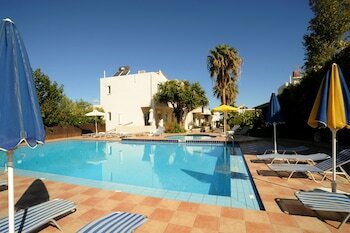 With a stay at Erofili Villas in Kefalonia, you'll be within a 10-minute drive of Lourdas Beach and Trapezaki Beach. Free self parking is available onsite. When you stay at Fretzato Traditional Guest House in Pyli, you'll be 14 minutes by car from Pertouli Ski Center. Featured amenities include express check-in, luggage storage, and laundry facilities. With a stay at Lefkada Summer House in Lefkada, you'll be near the beach and close to Episkopos Beach and Nidri Waterfalls. Free self parking is available onsite.